Leeds will be charged with misconduct by the Football League if they ban Sky TV from broadcasting Tuesday's Championship game against Derby. The club has barred cameras from entering Elland Road for the game (19:45 GMT) in protest at the number of Leeds fixtures changed for television. 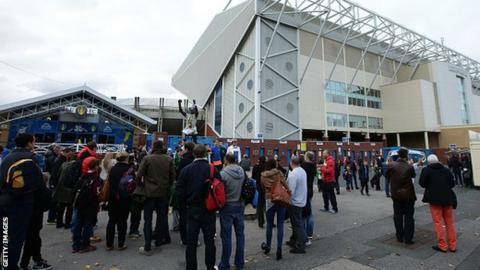 It is the ninth time a Leeds league match has been picked and owner Massimo Cellino feels it reduces attendances. Football League officials are trying to resolve the situation. Leeds, 14th in the Championship, have been contacted by the BBC but are yet to respond. "The League has been made aware that Sky personnel have been unable to access Elland Road as previously arranged," a Football League spokesman said in a statement. It added: "Under Football League regulations, clubs are required to provide access to the League's broadcasting partners for the purpose of setting up and filming any matches that are selected for transmission. "Failure to do so will lead to a club being charged with misconduct." The Football League said the matter would then be referred to an independent football disciplinary commission. Sky have yet to comment. Football League chief executive Shaun Harvey - a former Leeds chief executive - was at Elland Road on Tuesday afternoon to continue negotiations. Second-placed Derby have already featured in eight live televised games this season, the same number as Leeds. Derby declined to comment. Nottingham Forest have appeared in nine, the most for any Championship club, while Preston, Brentford, Charlton, Rotherham and MK Dons have featured in two each. He is in Miami, US, and will not be present at Elland Road on Tuesday and has left the enforcement of his ban with other staff. "Massimo Cellino feels the current deal strangles the club, the supporters and the players in their preparation, logistics and attendances. "He is no stranger to challenging football's authorities and wants to negotiate TV rights individually, rather than as a collective unit. "It is estimated that Championship clubs get about £100,000 as compensation when a home match is moved for television to cover for fewer fans going to the game. "That amount works out at about 3,500 supporters paying an average of £30 a ticket. It will be interesting to see the attendance against Derby. "The Football League has not revealed what the potential punishment could be if Sky are not able to televise the game."